Thanks to you, 2007 has been my most successful, exciting, satisfying year ever in travel, going places I've never been, both personally and - almost as much fun - vicariously through your adventures. I'm especially excited to have just confirmed the first Virgin Galactic space flight sold through the exclusive Virtuoso booking agents in Canada. What an exciting start to 2008! More new adventures and developments are already in the works for 2008, including a safari into three Orient-Express camps in Botswana in April, accompanying my first-ever group on a Crystal Cruise in May (we still have room for you to join us! ), and the imminent launch of a brand new RogerKershaw.com website powered by Virtuoso's incredible booking engines, and a second website coming to feature cruises exclusively, the fastest growing luxury segment of my business today. It's going to be a lot of fun, especially because we'll be enjoying it together! First Class - Is It Worth It? My favourite and without doubt most important trade show of the year is the International Luxury Travel Market each December in Cannes. Attendance for 1200 top travel agents from around the world and 900 suppliers is by invitation only, a ticket as hot as the Film Festival a few months earlier. This year we were also guests of Orient-Express to a pre-event in Carcassonne, France, long a destination on my Wish List, finally a reality. We stayed at the beautiful Hôtel de la Cité within the walled city, overlooking the castle grounds, with views of both the ancient UNESCO-designated city and the modern city below. Highlights of this stay included, in addition to simply ambling through the cobbled streets, unique shops and historic basilica, was a full medieval dress banquet in the castle, a day trip to Narbonne and, on the bus ride to Cannes, a stop at another frequently referred but never yet visited country resort, Hôtel Le Mas de Peint in the Camargue region. Arriving in Cannes, we had one day to shop and explore and eat and fall in love again with this wonderful part of the world, before the meetings: three days of 20-minute appointments with the crème de la crème of the luxury world, both inside and outside the Virtuoso network. This incomparable opportunity to make new contacts and strengthen old ones is complimented by a full schedule of site inspections, this year including the Four Seasons Provence at Terre Blanche and the Relais & Châteaux property, Hôtel Imperial Garoupe. 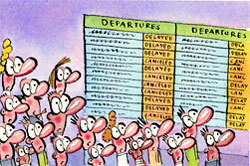 But most importantly, at every turn is a new opportunity to make your next travel experience a trip into paradise. Let's go! I can hardly wait! Sports Equipment. Air Canada now asks that passengers register their sports equipment before check-in. Doing this in advance will waive the excess piece fees for hockey sticks, ski boots, and snowboard boots, and the oversize fee for skis, snowboards, hockey sticks, and hockey bags. Failure to register this equipment in advance will attract all applicable excess piece and oversize fees when checking in at the airport on the day of departure. As you might expect, there are still rather complicated rules and restrictions, so please let me verify the current situation for you at time of booking. Mobile Boarding Pass. Air Canada has introduced paperless boarding passes for its customers who check in using their PDA (such as Blackberry or Treo) or cell phone. Air Canada's mobile check-in service, available at mobile.aircanada.com, has been enhanced to now offer an electronic boarding passes in the form of SMS text messages you simply shows to airport security and Air Canada gate agents, in lieu of a paper boarding pass. More details on this, and other mobile services, here. Mayaguana, Bahamas. Officials broke ground on a 7,300-foot runway and international airport terminal on the island of Mayaguana, a sleepy Bahamian outpost 350 miles southeast of Nassau in the Bahamas Out Islands, about 50 miles west of the Turks and Caicos. Mayaguana, the least developed and most isolated island within the Bahamas, is all about to change. The first phase of the development project will include a luxury boutique resort; restaurants; a spa, a yoga facility and a fitness center; a marina village; private villas; and four designated nature preserves. No timeline has been released. The Ritz-Carlton, Bachelor Gulch announces Ski Nanny. The Ski Nanny gives parents some extra time alone or on the mountain by delivering young guests to Ski School in Beaver Creek every morning. The Ski Nanny also picks the children up from Ski School at the end of the day and brings them back to the RK Corral where they can stay for Munchies and a Movie at no additional charge. Luxury Villa in the Galapagos Islands. International Expeditions' exclusive luxury villa located on the island of Santa Cruz, in Galapagos, is surrounded by the most impressive fauna, scenery and beaches in the world. Almost everything is included in a program customized for you and led by your private naturalist guide. More. Consulting firm Skytrax has announced this year's Ten Best Airports, with few surprises among them: Top honours go to Hong Kong, second place is shared by Seoul and Singapore. The top North American airport is our own Vancouver, in eighth place, the only one in the top ten worldwide. While Skytrax surveys 8 million passengers, a much more informal survey conducted by an International Herald-Tribune journalist of fellow road warriors, reveals their hands-down choice for World's Worst: London Heathrow, with its miles and miles of passageways and tunnels. (Dis)honourable mentions went to Charles de Gaulle, Leonardo da Vinci (Rome), and Frankfurt. One comment: "If Heathrow is like being on a Long March, then Charles de Gaulle in Paris is like being in an Escher print." The hotels around CDG do a bang-up job of hosting travellers stranded by missed connections, which can be - as it was for us as we returned from Cannes in December - a blessing in disguise. Missing a tight but "legal" connection there, we were "forced" to overnight at AF's expense and spend 24 hours with nothing to do but graze through the streets of Paris. Tough life. With the Meals for Sale and $2 pillow packs in Economy, it may seem that airlines are taking more out of passenger comfort than ever thought possible, but just the opposite is happening up front. Check out this link for some of the latest developments in First Class on seven of the world's leading airlines. Then call me when you'd like to book your next massage at 40,000 feet. I'm always on the lookout for new hotels, and ILTM is a rich source for that search. Instead of my normal "Feature Destination" here, I'd like to share some of many discoveries that may be your next Destination. 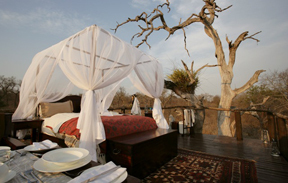 Lion Sands Ivory Lodge, Sabi Sand Game Reserve, South Africa, is ultra luxurious, yet simple and uncluttered. Six private villas, or try spending a night under the African stars in one of their unique Treehouse experiences (photo above). Hermitage Bay Resort, Antigua, with just 25 extraordinarily spacious Cottage Suites landscaped into the natural beauty of a perfect bay and hillside of tropical gardens in one of the most secluded corners of the island. Hodges Bay Club, Antigua, rests in a quiet white sandy bay enclosed with rich lush tropical gardens. Ocean-front houses, penthouses, club apartments and a luxury hotel opening in May. San Ysidro Ranch, Santa Barbara CA, nestled into the lush Montecito foothills, this legendary hideaway is where Vivien Leigh and Sir Laurence Olivier exchanged vows and was John and Jackie Kennedy's honeymoon retreat. Singinawa Jungle Lodge, Kanha, India. "Protectors of the sacred forest.," this new world class resort in the tiger heartland of India is an eco-tourism initiative with a strong focus on wildlife conservation. St. Regis Kauai, Hawaii (the former Princeville Resort, reopening in 2009) perched on a bluff facing Hanalei Bay with spectacular views of the Pacific Ocean and the mystical Na Molokama mountains. Qualia, Hamilton Island, Australia. Time itself seems to stretch at this new resort on the Great Barrier Reef, an indulgent experience in a place of rare natural beauty. Sixty private pavilions, plus a Beach House with its own Guest House. The Levin Hotel, London. This sophisticated boutique hotel offers all the comforts of home, in twelve suites only, right next door to Harrods. 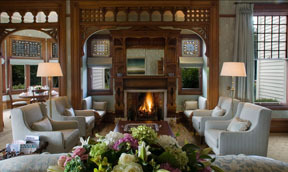 Otahuna Lodge, Christchurch NZ, where prestigious luxury accommodation meets exemplary service and cuisine in the context of an elegant, historic country estate. Just seven suites, all completely renovated and recently reopened (photo below). The highest compliment my clients can give is the referral of their friends, family and business associates. Thank you for your support.